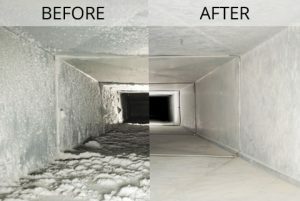 Industry standards recommend that you have your air ducts inspected every 2 years for cleanliness, and have them cleaned, on average, every 5-7 years. Of course, this will vary with the conditions in your home.Most homeowners have no idea what goes on inside their home’s air ducts. But the fact is, they can become littered with years of accumulated dirt, debris and allergens like pollen, dust and pet dander. Fresh Look ( formerly Sears ) Carpet & Upholstery Cleaning technicians use one of the most powerful and effective air duct cleaning systems on the market today. And of course, you can count on Fresh Look Carpet & Upholstery Cleaning for Satisfaction Guaranteed. Our technicians thoroughly pre-inspect your home’s air duct system. You will be informed of the air duct cleaning services needed, and the cost of such service, before any service will be performed. Our technicians clean all registers/ grilles, and the entire air duct system using a powerful vacuum along with specialized tools and brushes. All room vents are vacuumed with our truck mounted units followed by cleaning with the turbo spinner which is powerful enough to polish. Access holes (if not already available) are cut into the mains and your ducting is simultaneously brushed and vacuumed. The tight fitting vacuum brushes are pushed along the ducting dislodging the encrusted dirt from the walls whisking it away which ensure that the entire system is cleaned properly. Our experienced technicians will put the air duct system back together and clean up any remaining debris in the work area. Fresh Look ( formerly Sears) Carpet & Upholstery Cleaning highly recommends after the cleaning of your Air Ducts the application of Benefect Disinfectant & Fungicide “100% Natural” . Other related services are available for an additional charge, such as our Dryer Vent & Central Vac cleaning.